This is my code: 35744011. I think my code handles the Win case properly.But the strategy for Lose or Draw is somehow messed up. Help needed. how to calculate time complexity of B(div2)? Prime gap multiplied by for factorization. Hi, I can't see why consecutive primes' gap under 109 is less than 300. Is that inference of some theory? Would you pls explain a little more? Here is a link about the distribution of prime numbers. Basically, what it says is that the nth prime number is roughly equal to . This implies that if you brute force to check all consecutive integers that are less than y, you will likely find one in roughly 300 checks. If you check here, you'll find that to be pretty accurate. It's unfortunate because prime gap, while well known, I don't think is well known enough to be considered standard Div2 B level. It really rested on you knowing this fact. Thanks! But I still have a question: how do we get the number 300 from the number 109? Or is that just a common sense? What if in this problem y is less than 1010, how do we estimate the upbound of check steps under this circumstance? To be completely honest, I have no idea why it is as large as 300. From the link I shared, all you can deduce is that the average prime gap between prime p and the next prime is going to be roughly equal to , which would mean that on average, we only have to check numbers, but empirically it seems that 300 is what it turns out to be. It makes sense that the gaps tend to increase as the numbers increase, but I don't totally know how 300 was calculated. Well, I see, 300 is an exact number, but what matters in this problem is that according to prime distribution we know that search down from y is reasonable since there won't be too many numbers between two successive primes. I think there must be more interesting (maybe more effective?) ways to solve Div 1 Pro C.Could anybody share his or her solution? Mine is less effective, but it's more simple (probably). I like it. It's fairly simple. Thanks for sharing! There's a solution that uses 2 * n + O(1) operations. http://codeforces.com/contest/936/submission/35713391 I actually used the idea of inside/out during the contest and when someone told me the easier way to solve it I merged both approaches and this is the result. DIV B , C problem solutions please. Thanks for the clear editorial. However, I found it difficult solving Div.1 Pro.D . Since the official editorial hasn't been published till now, can anyone give me a solution? Thanks a lot. Greedy solution starting from the end of the line. For each row, keep track of the maximum first cell of the line in which a shot must occur to reach this cell. When you're done, check if the first shoot needs to occur before or after t. If before, answer is No. If after, you can loop through the grid starting from the start and construct the list of moves and shots. Imagine a state block that contains the two periods 0 -> k & 0 -> x where x is the smallest multiplier of d that is greater than k, that is 0 < k < x meaning that the oven is turned on for the period 0 -> k and then becomes off for the period k -> x, then again turned on for x -> x + k then turned off for x + k -> 2*x and so on... now given a point in time say p can you calculate the number of these state blocks and the corresponding time spent in either the two modes of the oven? hmm , let me explain my approach . k — time stove is on (in one time interval ) . rem — remaining work after num intervals . lets see when for the first time we find stove to be off . O it is shop, _ is empty space I think if we look in graph like in tutorial, we will find cycl, it won't be a tree. Could you explain it? I don't get your test case. "It's possible to get from any cell that doesn't belong to Gridland to any other cell that doesn't belong to Gridland by using only cells which don't belong to Gridland"
Can we solve the problem Save Energy using Binary Search too? Yes, if there are no vertices without outgoing edges, it must be a draw. However, it may be a draw even when there are no vertices with outgoing edges. You mean the situation when m = 0, or what? That's a single one, so. Or you ment something else? 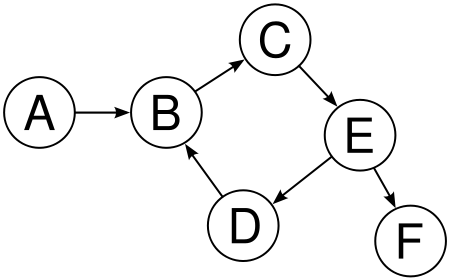 For example the graph here https://i.stack.imgur.com/pQxtv.png if you start at node A, the answer would be draw, even though there is a vertex without outgoing edges. Can someone help me notice whats wrong with my algorithm for DIV2D(Sleepy Game), its failing on testcase 28. So basically, i just make a graph like you would usually do, then start dfs from the node where the coin is initially positioned. I keep int array 'bio' which tracks 3 things: 0 if the node haven't been discovered yet, 1 if its being discovered and 2 if its fully discovered — this is to detect cycles in a graph, if at any point i get to some node that has edges that connect to a node that is being discovered then a cycle is detected. Now, in dfs function i keep track if the current node has 0 parity and if it doesnt have any outgoing edges — "if(!graph[a].size() && ! (path.size() % 2))" and also i have a vector that tracks the path, if a node that has 0 parity and no outgoing edges is found then print the path and exit, if not the check if theres a cycle and print "Draw" otherwise print "Lose". Judging by the test case 28 my code doesnt properly detect a node that has 0 parity and no outgoing edges i guess, since solution finds it and mine outputs "Draw". Your code is failing for this input. keep one thing in mind that if you re-visit any node from a odd length cycle, your parity will change and thus possibly help you to win. I see, thanks a lot for the help! Why does this solution in "Sleepy Game" gives TLE in test 20? I think your solution prints infinite number of nodes which causes TLE. Be careful with your print() function. Solution to 936C is not clear from the editorial! Can anyone please explain a bit more in detail? In Div2 D/Div1 B, my submission got Wrong Answer on test 35, please, I need help in why it is WA. My logic is to start a DFS from vertex s, and allow each edge to be visited two times atmost, so I can test if any cycle will be useful for Petya to win. And any cycle will make the answer atleast Draw. If there isn't any cycle and all the leaves vertices don't make Petya the winner, then answer is Lose, beacause it is impossible to make 10^6 moves in 2*10^5 edges which atmost will be visited one time. Server time: Apr/21/2019 18:19:01 (e3).